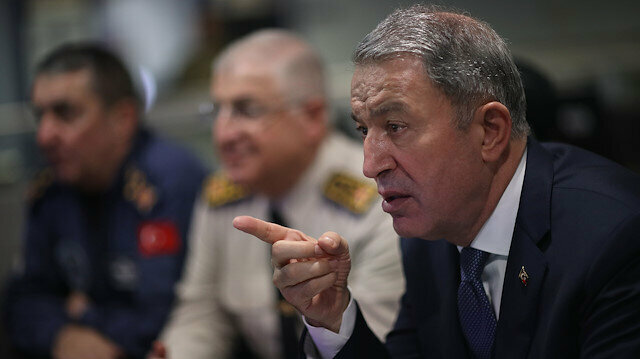 Turkey will bury Kurdistan Workers' Party (PKK) terrorists in the ditches they had dug in Syria "when the time comes," said Defense Minister Hulusi Akar on Thursday. "We now have Manbij and east of the Euphrates ahead of us. We are working intensely in this regard," said Akar during his visit to Turkish forces in Doha, Qatar. He added that "terrorists in Iraq's Sinjarand Mt. Karajak regions were neutralized without harming any civilians or innocents." An operation east of the Euphrates, which Turkey’s leadership has been suggesting for months, would follow two successful cross-border Turkish operations into Syria since 2016 -- Operations Euphrates Shield and Olive Branch -- both meant to eradicate the presence of YPG/PKK and Daesh terrorists near Turkey’s borders.